Honey Sriracha Coleslaw. Impress your guests with this easy barbecue side salad. Creamy, sweet and spicy honey Sriracha dressing over healthy coleslaw salad. 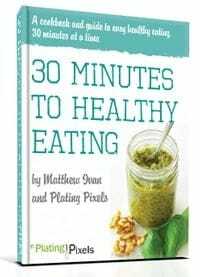 With summer holidays like Memorial Day and 4th of July coming up, you’ll want some fun and creative recipes to wow your guests, or hosts. 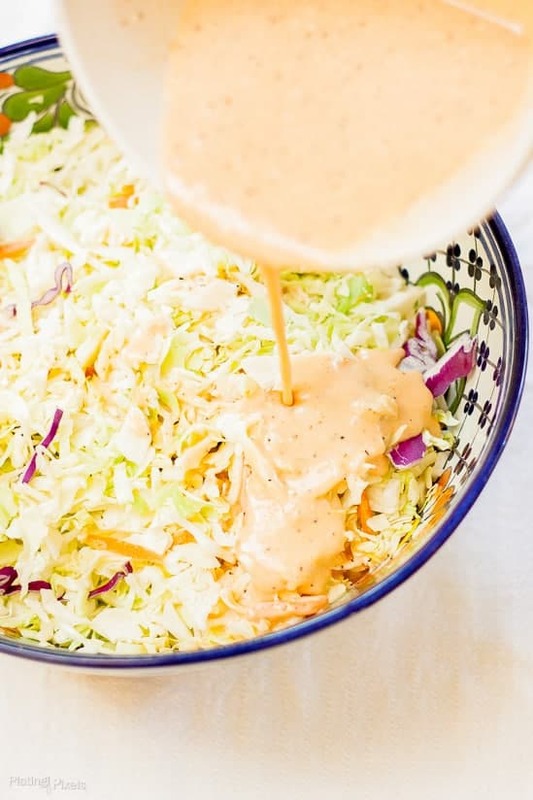 Let’s look beyond the all-too-easy store bought 7-layer dip and try something unique; like this sweet and slightly spicy Honey Sriracha Coleslaw recipe. 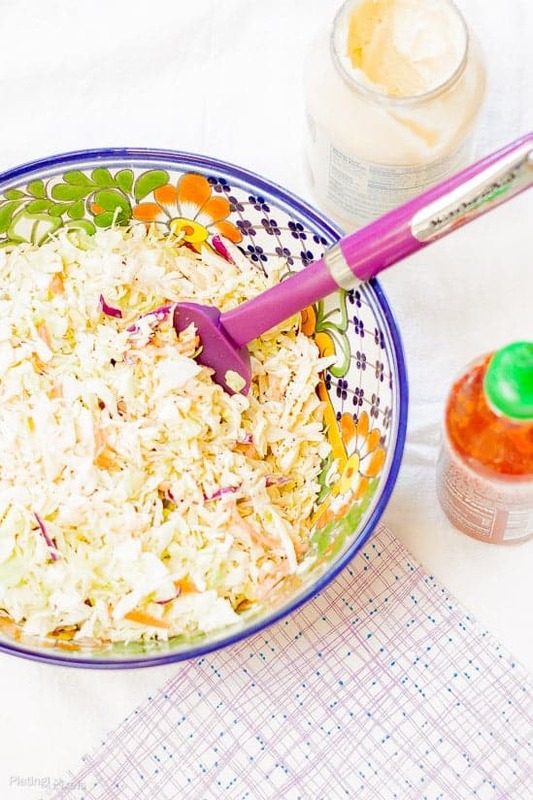 You’ll impress them with this spin on a traditional barbecue coleslaw salad. Some friends of ours visited Las Vegas and were gracious enough to let us have a barbecue get-together at their home in their absence. Of course, they’re adorable dog Maggie needed to be babysat so it was a win-win. As the food bloggers of the group, it’s our job to bring unique dishes and baked goods to these potlucks; apparently we’re all foodies. There’s something about grilled pork chops, burgers, lobster and corn that makes you want a good old-fashioned coleslaw. I think these foods are best buddies, and go together well. By this way, this coleslaw recipe has passed the unofficial taste recommendation test: two friends who said they don’t ever eat coleslaw came back for seconds. Making this Honey Sriracha Coleslaw is a simple as can be. It literally takes less than 10 minutes from the start of popping open that bag of coleslaw veggies to the smiling satisfaction of tasting it. First mix together the short, but important list of ingredients for the sauce, pour over salad mix, stir and….well that’s it! Can’t get much easier than that. Have a fun and safe summer while enjoying your Memorial Day and 4th of July barbecues! Want to know how to avoid a sticky mess and cleanup when you measure things like peanut butter, honey or mayo? It’s so simple! Spray a bit of cooking spray into the measuring cup (or grease with a bit of olive oil and paper towel), then add your ingredient. Now watch it literally slide out with no cleanup. Hope that blew your mind like it did mine. Dietary Options/Substitutions: This recipe is vegetarian and gluten-fee. For vegan use eggless mayo. If you don’t like spicy, reduce or omit hot sauce. Honey Sriracha Coleslaw recipe. Impress your guests with this easy barbecue side salad. Creamy, sweet and spicy honey Sriracha dressing over healthy coleslaw salad. 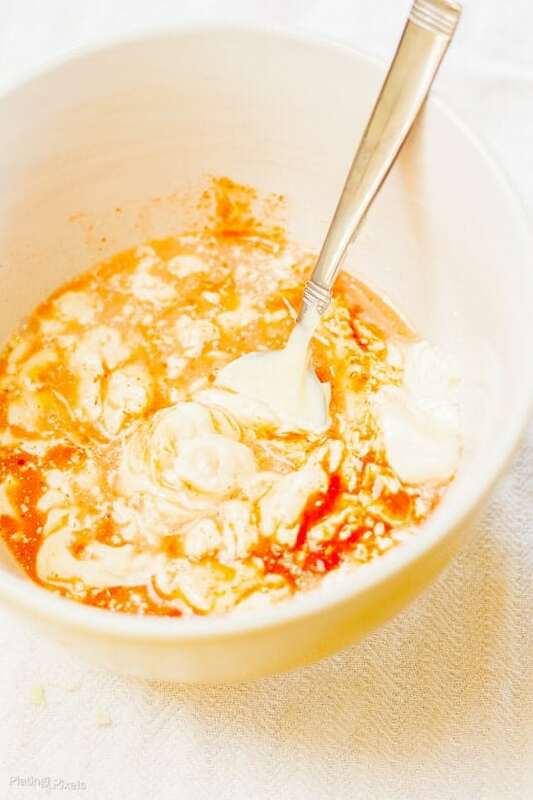 In a small bowl whisk together first 6 ingredients from honey to black pepper. Place shredded coleslaw vegetables into a large bowl. Add coleslaw dressing, fold and stir to evenly combine. Salad should be evenly coated, without too much excess liquid. Can serve immediately, but best if you keep covered in the fridge for at least 45 minutes for flavor to soak in. This coleslaw would make the perfect topping to my Carolina Style Pulled Pork Sliders. I’m super picky about my coleslaw and I made this today and it was awesome! Deeelish!! Will only make my own from now on! Thanks Matthew! I love this cool/hot/sweet coleslaw! Thanks Ginny! Perfect for summer right? Wow, great combination of flavors! I’m really interested to try this out! Thanks, you totally should Anita! Such big, bold flavors here. Love it! 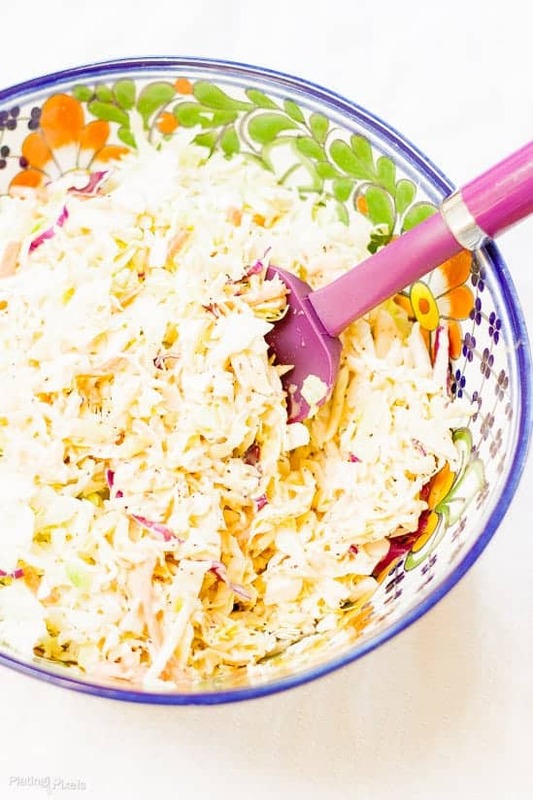 Sweet and spicy coleslaw sounds addictive! 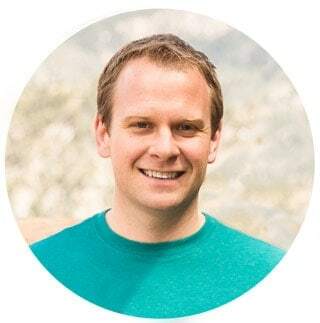 Love your tip for measuring cups…I always measure out olive oil first and then a sticky ingredient with the same effect. It is Marjory! I never used to do that or remember oil first. If there’s no oil in the recipe then the spray still helps with the sticky stuff. So much nicer than traditional coleslaw! Thanks Sylvie! It is a fun twist. oooo sweet and spicy – what a great twist on coleslaw! It’s always a good combo. Thanks Steph! I love cole slaw. I’ll bet your sriracha version is yummy! Thanks Cynthia! It is and I’m sure you’ll like it. I’ve made coleslaw with Green Tabasco, but never with sriracha sauce, I’m sure I’d like it though! Love anything spicy! Anything sweet and spicy – sign me up! I’m a huge coleslaw fan I love the addition of sriracha, awesome idea! LOVE coleslaw, and absolutely genius adding sriracha in it- The best condiment! Honey AND Sriracha? You are speaking my language! This looks similar to the dressing that was on a salad I had in South Korea that I haven’t been able to replicate. The ingredients sound right though, and I remember it was served over green cabbage. I absolutely must try this. It’s an awesome combo right Stephanie! Glad I was able to inspire you on the dressing. Hope it’s a match!